Concept Big Brands Carnival is a unique concept and will be the largest event of its kind organized in Dubai and the region for internationally branded luxury goods such as: – Perfumes & cosmetics – Skincare & bath line products – Watches & Jewelry – Writing instruments – Designer footwear – Apparels & linens The purpose of this mega sale event is to consummate the seasonal shopping impulse of middle class consumers by offering them mouth watering discounts of up to 80%. Sales will be usually held during Summer, Ramadan, Christmas and New Year. 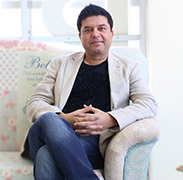 Vijay Samyani, Founder & Managing Director is the dynamic visionary and founder of Concept Brands Group. A professional turned entrepreneur he has previously held senior management positions in the luxury and lifestyle industry last 20 years. Vijay has exhaustive experience in this industry in the areas of global marketing, business affairs, corporate communication and global strategic procurements with great exposure to setting up green field projects. He was instrumental in introducing & innovating various best practices, strategies and process for revenue / yield management, ensuring quality and customer delight. Concept’s vision is to cater to the average consumer and the team is developing and contributing all their efforts to serve them. The team has thorough local knowledge, experience and a stellar reputation. Concept has inspired to engender numerous independent, leading and successful companies in the region. The team has an eye for identifying creative business ideas in the emerging market and expanding its operation into diversified lines of businesses. Our vision is to make your preferred shopping destination in all channels by providing outstanding value for the leading international brands by constantly fulfilling your expectation of pay less, shop more. We are aiming at constantly bridging the gap between luxury brands and consumers. Our mission is to be one of the leading brand house who is innovative in terms of value, quality and services when it comes to distribution/wholesale trading of internationally renowned brand names in lifestyle fashion. By means of this portfolio of brands, our aim is to expand in Oman, Kuwait, Saudi and other GCC regions alongside Asian countries as well.